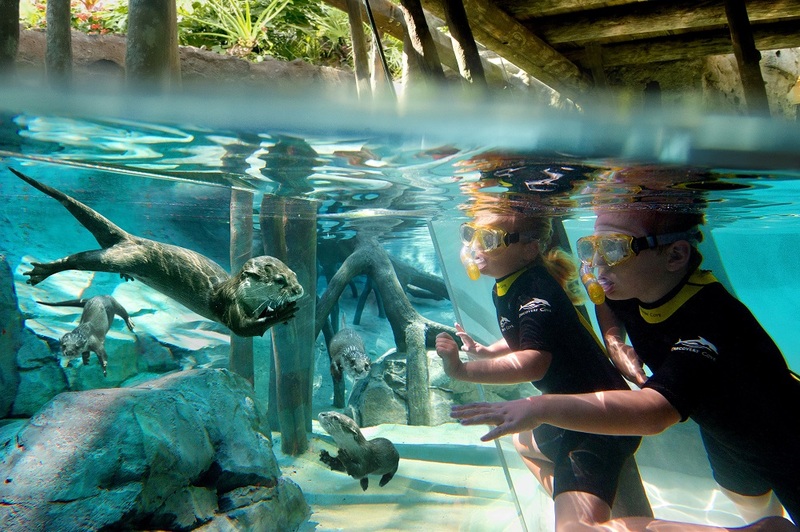 Discovery Cove is one of Florida’s most in-demand parks – and believe me, it sells out fast. 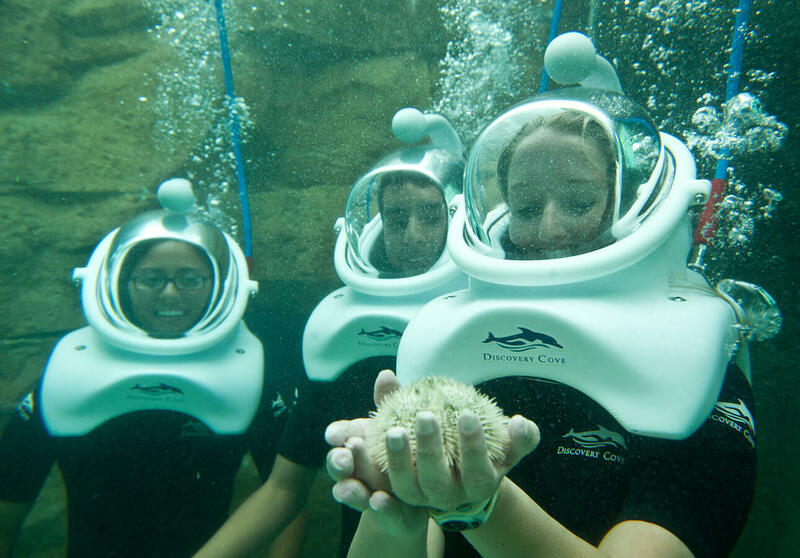 Its exclusivity is part of what makes Discovery Cove such a wonderful experience. Visitor capacity is strictly limited to ensure that there are no queues and no crowds, but it does mean you need to get in quick to book tickets for the date you want! Once your Discovery Cove tickets are safely booked, it’s time to start daydreaming about the perfect day in this little piece of paradise! The single most important thing to wear for a day at Discovery Cove? Your swimsuit! You can also wear water socks or rubber pool shoes if you like. Plus don’t forget some dry clothes for when you come to leave – but we won’t think about that just yet! Don’t worry about needing a wetsuit, you’ll be given one when you arrive. But no jewellery please (except watches and wedding rings) as it can be dangerous for the animals. Whatever you do, don’t apply any sun lotion before you arrive! Normal sun lotions can be harmful to the marine life, so you’ll need to use a special, animal-friendly sunscreen. You’ll be given a sample of this when you get to Discovery Cove, but its worth budgeting to buy some more of the safe sun-cream into your day (about $20 should cover it). You’ve only got one day there so you want to make the most of it! Plus if you’ve booked a dolphin swim, the times are allocated on a first-come first-served basis. So once you’ve got your time, you can decide how to plan your day around it. The first thing most people think about! Make sure you arrive with stomachs nice and empty, as the food at Discovery cove is all-inclusive and freshly-prepared, so you can get stuck into something yummy straight away. TIP: If you want to drink alcohol, remember to take your ID! You must be over 21 to drink in the USA. Once you’ve eaten, the next task is to get kitted out at one of the equipment bays! This is where you’ll get your wetsuit (you can choose from full body or just upper) as well as a snorkel, mask and that important animal-friendly sun cream. You can also get a locker to put your valuables in. Visitors aren’t allowed to bring possessions or jewellery into the main marine areas of Discovery Cove as it could be harmful to the fish, rays and dolphins. The best places to bag your lounger are by the Grand Reef or near Serenity Bay – a warm freshwater pool with white sand and shallow waters. Tip: Avoid the temptation to take a lounger in front of the Dolphin Lagoon – the water here is just for people taking their Dolphin Swim. You can see the dolphin swims easily from the North Beach. Then it’s time to decide which part of the cove to explore first! In these stunning gardens, exotic birds of all shapes, sizes and colours fly freely around you – and are only too happy to perch on your shoulder or feed from your hand! 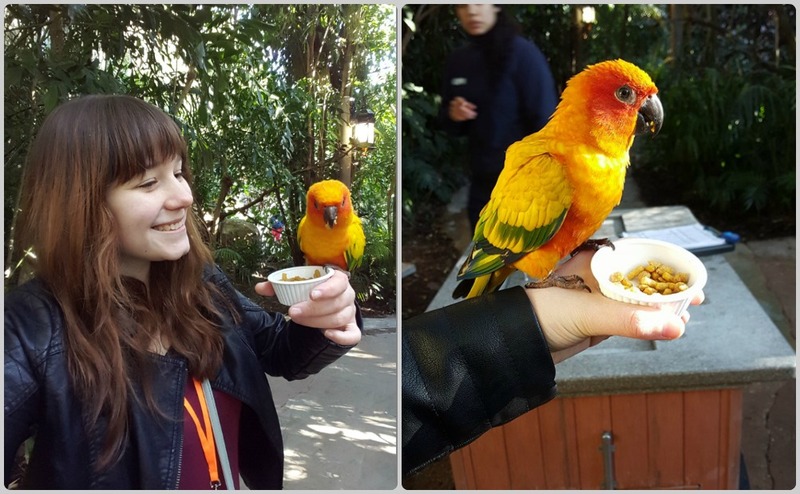 Try to visit the aviary early in the day – this is when the birds are hungriest and you’ll have the most fun feeding them! (Bird feed is provided at no extra cost). Even if you prefer not to hold the birds, this is a great place to spend some time out of the water, and the walk through the gardens is beautiful. 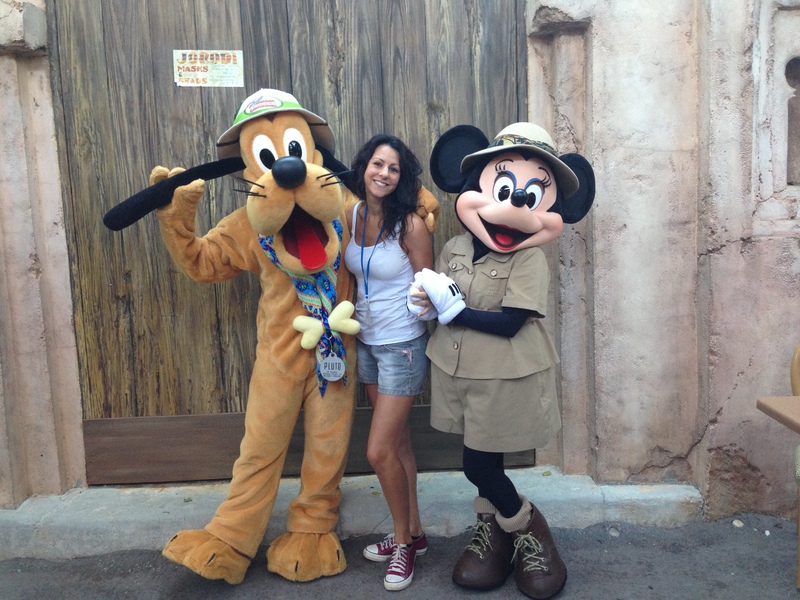 Tip: You might want to wear shoes in this section of Discovery Cove, as the birds have been known to nibble at feet! Go snorkelling or swimming in this beautiful coral reef, where youll be surrounded by thousands of colourful, vibrant tropical fish, as well as rays and other fabulous marine creatures. There are plenty of shallow areas so kids of all ages can enjoy the water – and the fish! 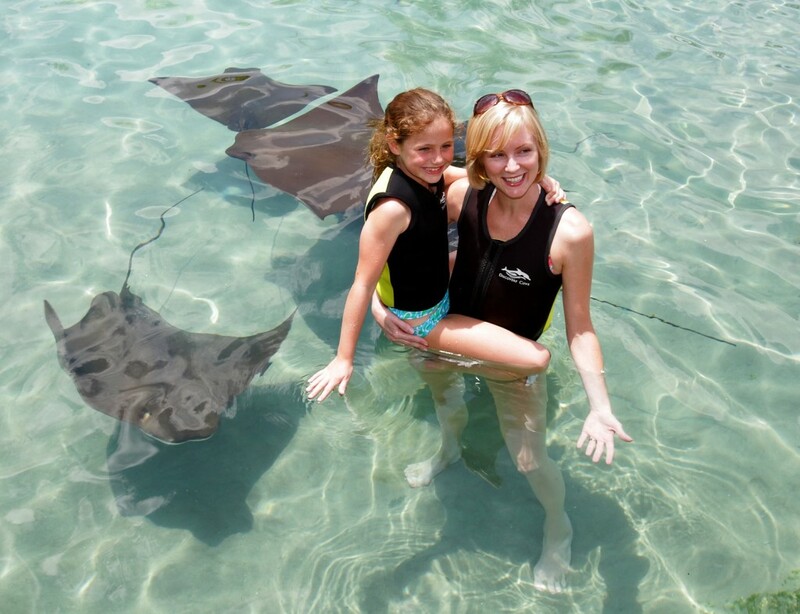 Try to be in the Stingray Shallows at feeding time and you’ll have the chance to feed the graceful rays as they glide around you in waist-deep water. Tip: Prepare for the fact that the water is quite cold – after all it needs to be a suitable temperature for the creatures who live there! Time for your Dolphin Swim! Its easy to lose track of time at Discovery Cove – but whatever you do make sure you leave plenty of time to get to the Dolphin Lagoon for the highlight of your visit – the Dolphin Swim! After a short briefing from the dolphin trainer, you’ll be introduced to your friendly, gentle dolphin to swim, play and hug in some group interaction. Then its time to go for a ride! You’ll take turns in holding onto the dolphin’s dorsal fin as he glides through the water – an experience you’ll definitely never forget! You can’t bring your own camera into the lagoon, but there’s a photographer on-hand to get some amazing snaps! You’re guaranteed to get your own photo opportunity with the dolphin. The dolphin interactions are about 30 minutes in total. 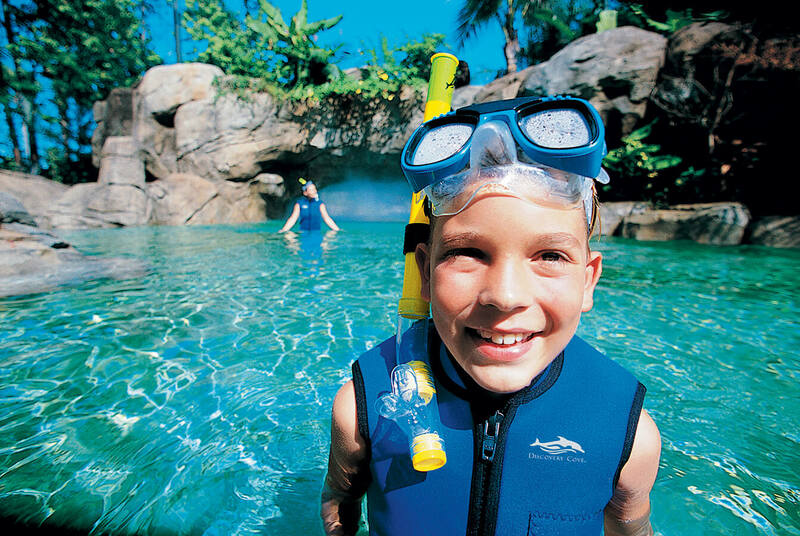 Tip: Make sure you select the Discovery Cove SWIM ticket if you want to include a dolphin swim in your day (If you don’t, select NON-SWIM tickets). Want to relax, but don’t want to miss out on any of the action? This is the place to head next! You can choose to wade, swim or float down this waist-deep tropical river as the rainforest canopy comes to life above you. The stars of this area are the cute marmosets, whose antics you could easily spend hours watching, and the entertaining otters – especially at feeding time! There’s also loads of beach space to just relax, chill out and soak up some rays. Little ones can play in the shallows and adults can take a swim or just enjoy some quiet time in the sun. Above all, don’t try to rush your time at Discovery Cove or you won’t experience it as the wonderful, relaxing day it’s meant to be. Enjoy it at a leisurely pace – you’ve got the whole day after all! At some stage before you leave for the day, make sure you stop by the photo area where you can buy the professional photos of your Dolphin Swim in prints, keyrings and more.